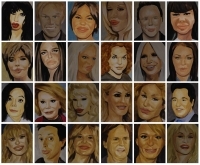 The series of paintings called "The Hybrids" analyze a contemporary phenomenon of plastic surgery. The day the clowns died. On July 6 1944, in Hartford Connecticut, there was one of the worst fire disasters in the history of America. The fire started during an afternoon matinee at the Ringling Brothers and Barnum & Bailey circus, which had an audience of 7,000 people. The circus bandleader Merle Evans was the first to spot the fire and instantly directed the band to play The Stars and Stripes Forever, a tune that traditionally signaled alarm to all circus personnel. The ringmaster Fred Bradna desperately tried to urge the audience to leave in an orderly fashion, but the power failed and no one could hear him. More than 160 people died and 700 were injured.